The intersection of Media and Technology. That’s how Mark Glaser, executive editor of PBS MediaShift, describes this fascinating project. MediaShift examines the disruption that online technology is introducing into the traditional media world. It not only provides reporting on new technologies and how businesses are meeting the challenge, but it also provides a forum for public feedback and participation. Could you tell us a bit about how MediaShift and the Idea Lab got started? MG: In 2005, I was writing a column for USC’s Online Journalism Review about new media and blogging. I wanted to do more than just write about what was happening — I wanted to do a blog myself, actually do the things I was writing about. Walk my talk, so to speak. So I wrote up a proposal for MediaShift, and was hoping to get foundation funding but distribution through a media outlet. I pitched it to NewsHour, who told me they couldn’t do it at the time, but that I should pitch PBS. I didn’t even realize they were two separate entities, but I did pitch PBS and not only did they want to do it, but they also would fund me partially. They also allowed me to continue fundraising for it, so I got a grant from the Knight Foundation, which funded my podcast and video show (5Across), as well as the new Idea Lab group blog for News Challenge winners. What would you consider to be your greatest triumph in working with MediaShift? MG: My greatest triumph was one of the first stories I wrote, which was about U.S. soldiers shooting videos of battle in Iraq and turning them into music videos that they posted on a new service called YouTube. It led to a number of stories about military policies on blogging, video and photo use, and there was eventually even an MTV special on soldier videos that was heavily influenced by my reports. There have been numerous other triumphs over the years, including a great series we did last year on content farms. Probably the biggest triumph on the business side of MediaShift was figuring out a path to sustainability in public media during a terrible recession. As a content creator myself, one thing I’d like to hear more about is the coverage your team has done on content farms. What sort of research went into it, and what would you say the final conclusions were? MG: We had numerous contributors do stories about content farms, including a guide to them, learning how they train writers, a video roundtable discussion about them, and more. Probably the most damning story came from Corbin Hiar, who had a Demand Media contributor tell him that her “how to make gin at home” story would poison people. We had tons of comments from other Demand Media writers and it became a hot topic for weeks. The final conclusions for the special were that the content farms had figured out a formula for giving people what they were searching for — and creating content on the cheap — but that it was probably not sustainable over time if the quality was lacking. Here’s the link to all the stories in the “Beyond Content Farms” series. Everybody makes mistakes at some point. What missteps have been made in building your community? Have there been any large ones, and, if so, how did you recover from them? MG: Of course we’ve had our share of errors and mistakes and tried to fix them when we could. One big issue came up when a journalism student at NYU wrote about a class on the sly, criticized her teacher, tweeted about it, and took a photo in the class. She never told the teacher about the report and didn’t get the teacher’s side. I ran that story, and then the teacher banned Twitter and any blogging or writing about what went on in the class. The teacher overreacted, but the student should have talked to her ahead of time. I had to do a follow-up on the story myself, and NYU had to rethink its policies for students blogging and tweeting in class. The PBS public editor even wrote a detailed column about it, and said I should not have run the initial story. I don’t think the larger MediaShift community was too upset about the whole incident, and [people] were more upset about the way that NYU reacted to it. You’ve been at the forefront of change in the realm of digital newsgathering for some time now. What are your observations on how the transition to real-time information flow (as exemplified by platforms like Twitter) has changed the news? MG: I think it’s been breathtaking. Twitter didn’t [exist] a few years ago, and now we can’t imagine following a breaking news story without it. It has been a great tool for journalists of all stripes in gathering news, finding sources, verifying what’s happening on the ground, and making connections with the audience. Yes, of course, there’s plenty of misinformation and mistakes as well in the real-time streams on social media, but that’s something that journalists understand and have to consider as they go. I think the opportunities for journalists to mine Twitter and social media are endless, but hopefully they will only supplement the work of a journalist and not keep them from going out to cover news in person. What are your thoughts on the seemingly growing divide between the news as reported by mainstream media and that of bloggers and citizen journalists? What sort of news ecosystem do you see growing out of this, as Internet and mobile access move toward ubiquity? MG: I actually believe the opposite is true: There is a narrowing divide between news reported by the mainstream media and bloggers and citizen journalists. Look at a website like SFGate, run by the San Francisco Chronicle. It is filled with blogs, citizen photos, comments, and content from many outside sources. How can you call it mainstream media when it includes so many elements that we used to consider as being on a different side or from a different viewpoint? Mainstream media has adapted and evolved, in the best cases, and used citizen media to help make their work better. I think we’ll see more of this kind of collaboration — citizen media, bloggers, nonprofit media, public media — as the ecosystem matures and more people are using the Net and mobile. And mobile brings another level of personalization based on your physical location, which will be amazing if the privacy concerns can be dealt with. Google+ is the “new shiny.” What are your initial thoughts on its ramifications as a social layer rather than a social platform? MG: It’s hard to say right out of the gate since it’s only a few weeks old. I already notice that I’m using it more than I use Twitter and Facebook, so they must be doing something right. I’m not sure if they will get the masses (and all my non-techie friends) to join up in the future, but maybe that’s not the point. As someone working in news, what do you think of Google’s “no aliases” policy? Do you believe this will lead to less vitriolic discussion once people lose the shield of anonymity, or do you think that it will curtail free and open discussion? MG: It’s a tough call. I see the good on both sides of this debate. I like having people use their real names on social media and appreciate the way that Facebook has made that happen. But then again, I see poor-quality comments on Facebook even more than on MediaShift, where they can use aliases. And I do support letting people use an alias when they need to write about something sensitive that could get them in trouble. Now that social is an expected aspect of the Internet, and Google is beginning to integrate social media factors into search ranking, what impact do you foresee? Any thoughts on how this will affect your content and SEO strategies? MG: I’m not really sure at this point. I think MediaShift content will be the same as always. We’ll cover the intersection of media and technology, and find out which topics have the most resonance with our audience by traffic, engagement, and more. What’s your favorite way to waste time on the Internet? Silly YouTube videos? Online games, perhaps? MG: At the moment, it’s all on social networks — Google+, Twitter, and Facebook — and the silly videos that people post on those. I’ve got most gaming out of my system, after having done videogame reviews some years ago. Now it’s my son who has taken up that mantle. At what point did you realize the Internet was bringing a fundamental shift in axioms not just for communication, but for newsgathering in particular? MG: Probably in the mid-’90s, when I started doing website reviews and was writing the Media Grok email newsletter for [The] Industry Standard. It was a kind of proto-blog and made me realize that newsgathering, commentary, and linking were changing everything. 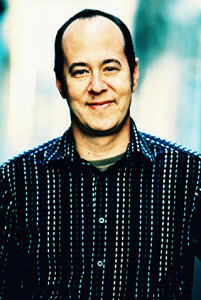 Image of Mark Glaser, used with permission.